In Part 2 I'm including some samples shots at f/1.8 and f/8 with blown up sections to show the quality. Clicking on these leads to a larger version in flickr. 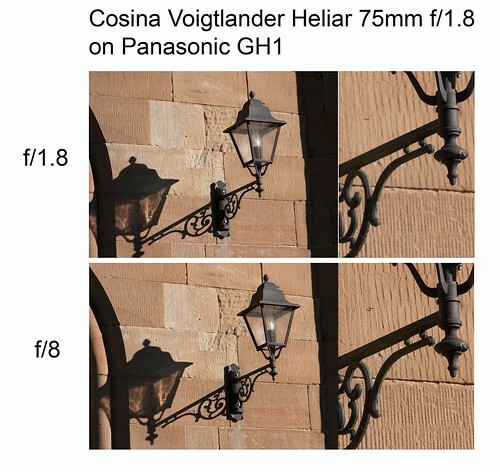 The Cosina Voigtlander Heliar 75mm f/1.8 Classic is a fine well-made lens that performs very well. There is some CA and fringing wide open and in keeping with many lenses of this type is sharpest in the mid-range, f/5.6 and f/8 being especially good. 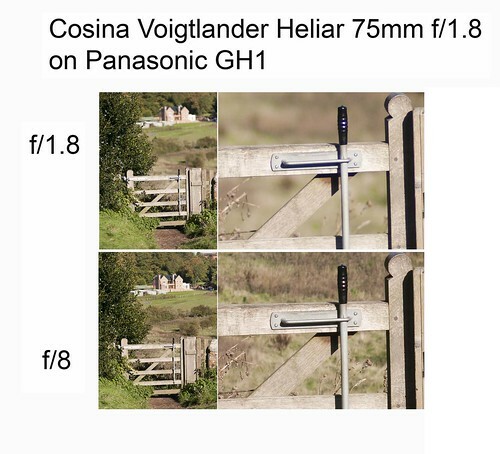 The results on my GH1 echo the results on my Leica M9, and its a very useful lens for both systems. For some time I used a Nikon 85mm f/1.8 on my m4/3 cameras and while it gave excellent results it was very large and bulky and unbalanced the camera(s). The 75mm is better in that regard and "fits" the GH1 very well. From the samples here and in Part 1 you can see how I've used the lens, which is for landscape / location work and for low-light interiors. For both of those requirements I found that it produced excellent images and most importantly, did so wide open at f/1.8. 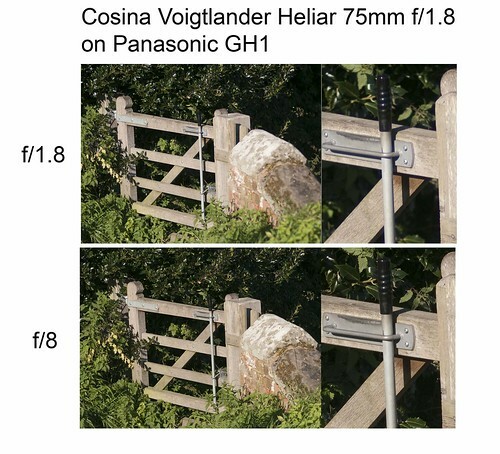 I would have no hesitation about using it at that aperture, and while it doesn't reach the heights of the Olympus 50mm f/2 wide open (and I'm beginning to think that not much does!) its perfectly suited for low light work. However as I have indicated there could be difficulties attempting to use the lens with m4/3 in fast-moving situations when precise and speedy focusing is required. 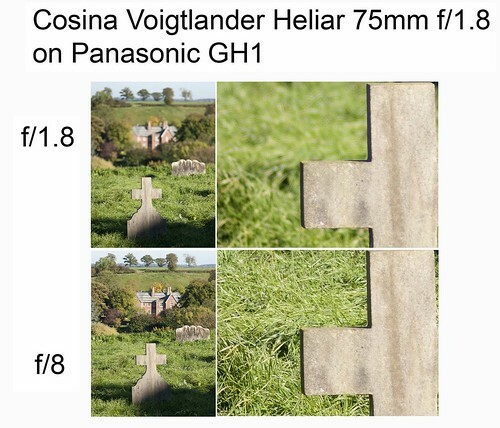 This is not the fault of the lens and more to do with the manual focusing capabilities of m4/3 cameras, which are excellent in terms of obtaining accuracy but are not designed for speed with lenses such as the Voigtlander. For example if I use the Olympus 50mm, which only focuses manually on my GH1, one touch of the focusing ring brings the magnified view into the viewfinder, and after focusing by touching the shutter button the magnified view disappears and I'm ready to to take the shot. Because lenses like the Voigtlander are not electronically coupled to the camera, I have to press two buttons to get the magnified view, which slows the process down somewhat. Olympus has a different system, but it still requires two button presses to get to the stage where I'm focused and ready to take the shot. 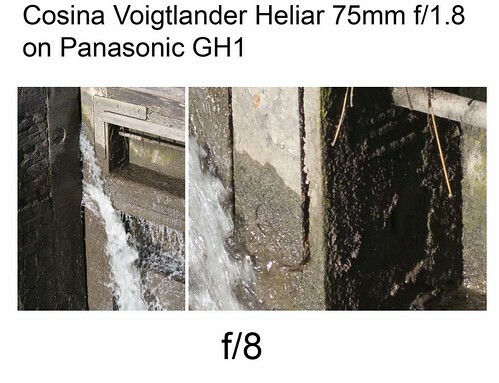 Its important to remember that lenses like the 75mm f/1.8 are rangefinder lenses and not designed for use with m4/3 cameras. Using them on these cameras is an "extra" and those who do so, myself included, are prepared to put up with the difficulties of using them. 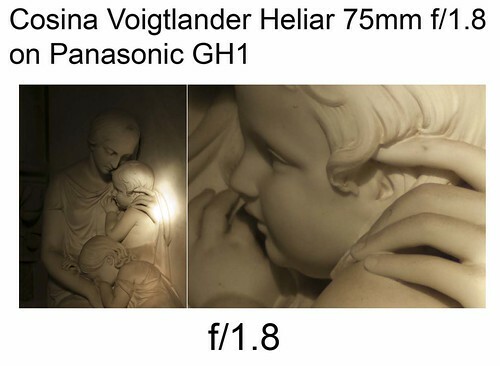 Personally I can't see myself using the 75mm f1.8 much on m4/3 for stills work. This has nothing to do with the lenses performance on the format, but more to do with how it fits in with the way that I work. The Olympus 50mm f/2 macro suits what I do much better, and with its extraordinary capabilities wide open, and more user friendly operation for my GH1 and E-P2 that is much more likely to be my lens of choice. I can however see myself using it a lot for GH1 video, where its much more suited to the kind of work that I do. I generally manually focus for video anyway, and use a tripod so the lens will be very useful indeed for low light situations. 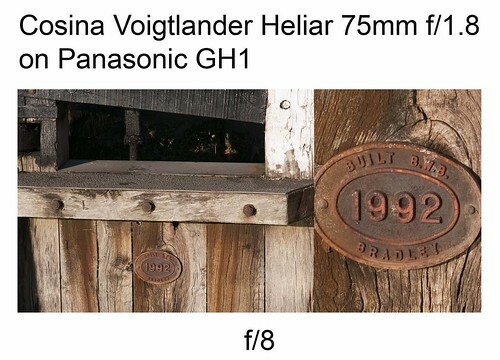 Finally, just to say that I have the first Voigtlander m4/3 lens, the 25mm f/0.95 on order and its apparently due in the UK sometime in November and its going to be interesting to see if there is any difference between that & the Voigtlander m-mount lenses on m4/3 other than the mount itself.